We’ve been hyping this one for a while, but tonight, Oct. 25 is the night world music inspired jam favorites Beats Antique bring their traveling caravan to Marathon Music Works. Helping in support are brass performers Too Many Zooz, and EDM producer Thriftworks. Music will start at 8 p.m. (doors at 7) and tickets to the 18+ show are available for $25. If you’re still on the fence about going, take a few minutes to read more about the performers after the jump. We bet you’ll end up catching the vibe, and we hope to see you at the show as well. 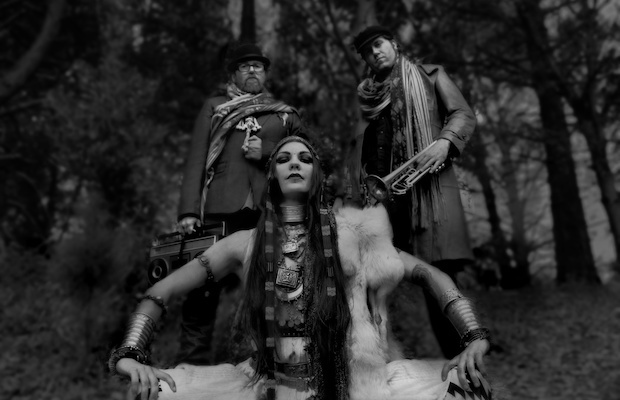 In a world saturated with music that is every band trying to sound just like one another, it’s always refreshing to know there are still people out there making truly one-of-kind music that could probably never be duplicated; enter Beats Antique. The trio got their start in Oakland, CA, around 2007, and ever since they’ve been combining elements of old and new world music to create something 100% unique. They infuse Middle Eastern belly dance music with hip hop, and old school jazz with afro-beat. Permeating throughout is electronic music. As they incorporate many different instruments to reproduce their sound at the live show, the group often slip into prolonged jams, with belly dancers and performance artists bounding around stage. Now eleven albums in– including their latest, Shadowbox, which dropped last week– they are still going strong, and showing everyone that it’s ok to be eclectic, and it’s always a good idea to cultivate your own sound. Be there in person for one of the most interesting live shows you’ll ever see, when the Beats Antique touring bazaar stops in on Music City. Three man instrumental sensation, who’ve made the increasingly common transition from internet fame to some level of real-life fame, Too Many Zooz rose to prominence thanks to the technology age. Trumpet player Matt Doe, baritone saxophonist Leo P. and drummer David “King of Sludge” Parks got their start busking in the NYC subway in the summer of 2013. Extremely talented musicians, they started to generate a following around the city, and soon people were showing up in bunches to watch them perform. One audience member shot a video, and posted it on YouTube (see below), and, thanks in no small part to Leo P’s awesome dance moves, it quickly went viral. That video, and similar videos are now generating millions of views. Fast forward to today. They have several records worth of instrumental material, including their latest full-length, Subway Gawdz, and they’re rocking with respect in front of paying crowds. See for yourself, live and in person, how the busking phenomenons got there well deserved clout. Jake Atlas, better known by his stage name Thriftworks, is an EDM performer and producer you should probably get in your life ASAP if you haven’t already. Prolifically releasing thirteen records since he burst onto the scene in 2010– including this year’s Low Speed High Drag & Red Leopard— Mr. Atlas stays busy, and is nearly a constant on the electronic festival circuit (Electric Forest Festival, Burning Man, Lightning in a Bottle, etc.). Originally hailing from Mechanicsburg, PA, he started dabbling in music at the age of sixteen, and later moved to California. He is now based in Berkeley, where he’s been blending genres of electronic music such as electro and dubstep with hip hop, always sure to be layered with heavy synth. Get to the venue early and see why he’s already toured with Bassnectar and STS9, and let him kick your party off right! Beats Antique, Too Many Zooz, and Thriftworks will perform tonight, Oct. 25 at Marathon Music Works. The show is 18+, begins at 8 p.m. (doors at 7 p.m.), and tickets are available for $25. Mercy Lounge Announces 16th Anniversary Bash on Jan. 22 and Jan. 29!